Today’s review will present you with our experiences of mattresses coming from two popular online mattress retailers: Tomorrow Sleep and Nectar Sleep. The cover is made from phase-change temperature regulating material with a breathable open weave, and a smooth and soft finish that adds to the comfort and airflow. Tomorrow Sleep comes in two firmness options, and the Medium Soft model that we tested scores 5-6 out of 10, with 10 being the firmest. Its top comfort layer provides a soft luxurious feel, and the underlying coils and foam provide good support underneath which makes this mattress ideal for heavier sleepers. The Tomorrow Sleep offers a lot of comfort as well. Coils combined with the gel memory foam top layer offer good push-back and bounce, and provide your body with a nice contour and hug. This mattress is supportive and allows you to sleep soundly in all sleeping positions, while the soft cover keeps you cool and adds to the comfort. 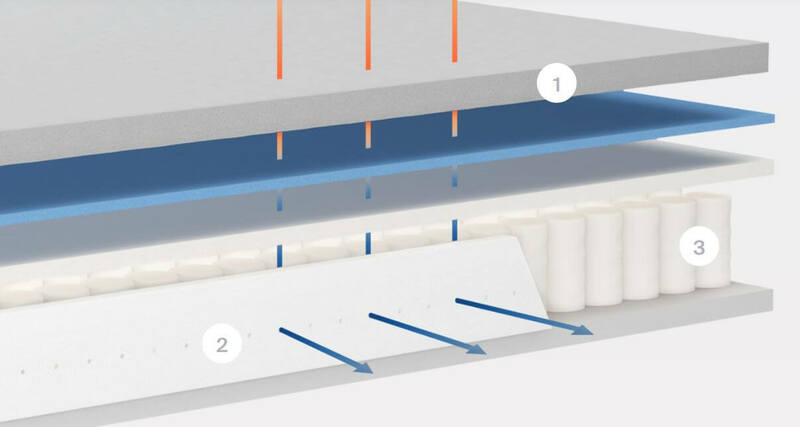 The Tomorrow Sleep does a good job in reducing heat due to the gel foam layer in the top comfort layer combined with the phase-change material in the covers. The nature of its innerspring coils allows good airflow, and perforated edge panels around the coils contribute to this. The Nectar is an 11″ all foam mattress made up of 4 layers of various foams. 1″ Top Comfort Layer – This layer is 1″ of quilted foam sewn into the cover and designed to improve airflow, relieve pressure points, provide pain relief, softness, and a luxurious feel to the top. 1″ Support Layer – This layer is 1″ of 4lb patented Lush Foam semi-open fast-recovery gel memory foam, which provides primary support and aids in cooling and comfort. 3″ Transition Layer – This layer is 3″ of 3lb medical grade cooling gel embedded foam that aids in cooling and serves as a transitional support layer between the upper and lower layers. 6″ Foundation Layer – This layer is 6″ of high-density foam that provides deep compression support and serves as the foundation. The cover of the Nectar mattress is made up of soft, long staple cotton that includes Tencel – a fabric more absorbent than cotton, softer than silk, and cooler than linen. It adds to the soft and luxurious feel of this bed, allows the circulation of air through the upper layer to improve airflow and circulation, and is naturally resistant to bed bugs. Nectar Sleep is unique in that it offers its customers the option to replace the cover at no charge. Therefore, if the existing cover wears out, you don’t have to spend your money on buying a new mattress when you can simply replace the cover. The nectar mattress only comes in one firmness option which is medium firm and scores 6 out of 10 on the firmness scale, with 10 being the firmest. Its top comfort layer provides a soft, luxurious feel, while the underlying support layers made of dense foam provide firmer support below and do not allow heavier sleepers like Andrew who is 230lbs to press through the top comfort layers and come to rest on the base support layers. The Nectar provides good support for all sleeping positions. It provides the necessary support for back and stomach sleeping and it provides enough give in the top comfort layer to perfectly hug and mold to hips and shoulders when sleeping on your side. The Nectar is a very comfortable mattress. The top layer with its Tencel cover provides a soft and supple sleeping environment, while the layers below consisting of gel foam and adaptive foam support and contour the body during sleep. These underlying layers also provide the needed response when switching positions during the night and a nice degree of push-back and bounce ideal for late night amorous activities of couples. The Nectar mattress, like the Tomorrow Sleep, does a good job at reducing heat, sleeping cool, and eliminating sweating and the feeling of stickiness present with many other memory foam mattresses. This is due to its multiple gel-infused foam layers and the quilted foam within the cover that allows easier circulation of air. Nectar does a pretty good job in this category as well as it does not cause too much sinkage when lying or sitting on the mattress due to the high-quality dense foam layers used in its construction. Edge support with this mattress is also good, and it prevents you from rolling off of the bed when sitting or sleeping near the edge. Motion transfer is very minimal with the Nectar due to its all-foam construction known for its capability of reducing the motion transfer when adjusting positions or getting in and out of bed during the night. Nectar gets high marks in this category too for not having any noticeable smell upon opening the box. There is not much off-gassing and odor with this mattress as it is the case with many other memory foam mattresses, and any smell present dissipates within 24 hours. Nectar is reasonably priced, coming in at $670 for a Queen (after applying the MFT125 coupon). This is a great price for a mattress of such a high quality. Click here to read the full Nectar mattress review. Below is our comprehensive side-by-side comparison of the Tomorrow Sleep vs. Nectar mattress. A medium feel –The Nectar comes in only one firmness option, which is a medium firm scoring 6 out of 10 on the firmness scale, with 10 being the firmest, and it is suitable for sleepers of different firmness preferences and different weights. A full memory foam mattress – The Nectar is a full memory foam mattress composed of the highest-quality memory foam layers. It offers the sleepers many benefits of traditional memory foam such as deep compression, pressure relief, more hug and contour, minimal motion transfer, etc. while at the same time provides enough support and eliminates the feeling of being trapped in foam that many classic memory foam mattresses cause. A very supportive mattress – As it has been already mentioned, this mattress offers enough support for all sleeping positions which makes it ideal for sleepers of different weights. Responsiveness and bounce – The underlying gel foam and adaptive foam layers of the Nectar mattress provide the needed response when switching positions during the night and a nice degree of push-back and bounce ideal for late night amorous activities of couples.